When Craig Rogers, the Pied Piper shepherd of Border Springs, sent me four good sized lamb bellies, I was intrigued. Craig’s exceptional lamb is familiar to diners all along the Eastern seaboard. Just check out the offerings at Bourbon Steak DC, Volt, or Husk. It’s good enough to be named right there on the menu. I’ll admit it, I was way beyond intrigued, I was thrilled. Seriously – what an opportunity! What fun! What a challenge! Lamb belly. An interesting cut, fatty and flavorful and very adaptable. 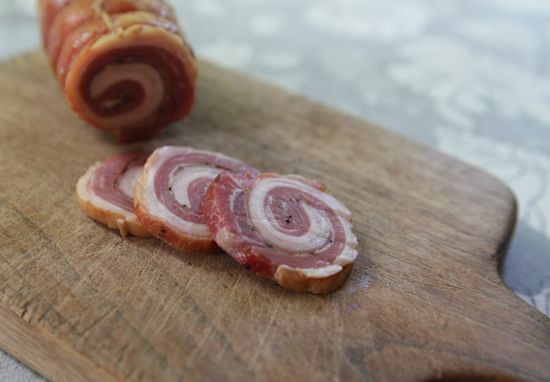 It’s also called lamb breast, and resembles veal breast in many ways. In fact, I wonder if the nomenclature is a nod to the US’ fascination with pork belly? Hm. Marketing. Looking at the meat, I could tell it could be cured like pork belly, brined or braised like brisket. It was a coarsely grained, well fatted cut. In all this, I was helped along by my virtual friend, Laura from Glutton for Life. Her take on lamb belly won a Food52 contest, and greatly influenced my technique. And really, I’m very pleased with what I developed and I’ve been so excited to share these recipes. At least I was, until David Lebovitz published this post today on Lamb Melons, which I totally would have done… Oh well, you can be sure I’ll be making one of these the next time I have some lamb in the kitchen. So, after thinking about all the good things I could do with these lamb bellies, I invited a couple of friends to a lamb tasting, and planned different applications, preparing appetizer, first and main courses, each supplemented by plenty of sides and appropriate condiments. It was my own little private lamb jam. The four bellies were lovely, somewhere between 3/4 and 1-1/4 lbs. each. I decided to do a little snazzy slicing. Here’s the way my mind worked. While at Camont, I had the privilege of watching Kari Underly butcher beef, and describe and define the cuts, explaining the structure and muscle. Then, I watched a pig breakdown, the Chef in charge trimming pork belly, and started to think about pork skirt, a new dish at (my favorite) Woodberry Kitchen. So, I decided to liberate some lamb skirt. The same place, the same look. A huge lightbulb was flashing above my head. The skirt cut, the grain, was all familiar from beef and pork experiences. I’ll admit, it was pretty awesome. I set the skirts aside with tandoori intentions. Indian spices, chiles and yogurt made up the marinade, in which they languished for two days. 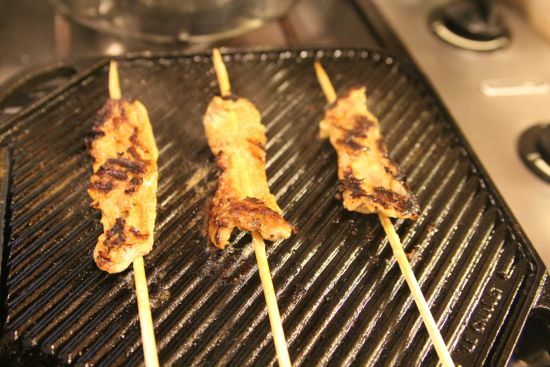 Sliced and skewered, I cooked them on a searingly hot griddle, and served them with spicy mango chutney and a cooling cucumber yogurt salad. Two of the bellies were trimmed into good sized rectangles. These were formed into Moroccan style roulades, stuffed with herbs and Merguez, braised in a wine and spice scented tomato sauce, finished with a gremolata/pesto mash up that kept the flavor bright. There was about a pound of trim, which I cut into cubes and red cooked, using the perfect directions from Kian of Red Cooking. Served over rice with broccoli and carrots, it was divine. Another lamb belly, cured for two days with salt, sugar and a little pink salt, was roasted at a low temperature for 40 minutes. The resulting lamb bacon is gamey and crisps up beautifully. It’s a great alternative to pork bacon and just as easy to make. I crumbled some over an arugula and feta salad for lunch and it provided all the umami of pork bacon, with the lamb-ish-ness that matched the feta wonderfully. And finally, I had to make lamb ventreche. Ventreche is my favorite thing to do with a pork belly, the most useful bean and soup starter, and for me, most redolent of the pig, in only the very best way. So, after a 24 hour salt cure, and a brief drying, a coating of black pepper and a proper trussing, the lamb belly had a low and slow hickory smoke and two days in the curing chamber. The resulting lamb ventreche is a wonderful flavor enhancer. I’ve crisped it and crumbled it over hummus. I’ve sautéed slim slices, and garnished a salad with the chips, which weirdly resemble fiddleheads. I’ve been thinking of a carbonara alternative using Israeli couscous, lamb bacon and duck eggs. So, thank you Craig. This has been a ton of fun. 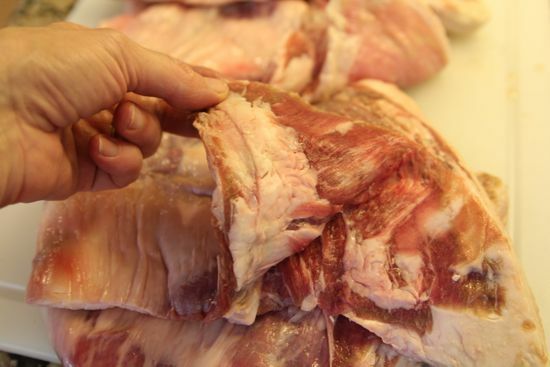 Trim the lamb belly into a rectangle. Mince all the herbs using a food processor or using your exceptional knife skills. Add the pistachios and blend until the texture is almost, but not quite, smooth. Add salt and pepper liberally. 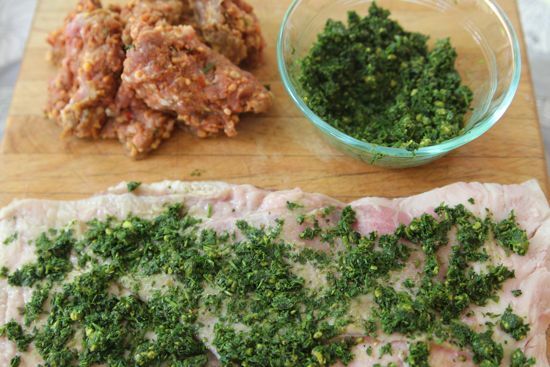 Press the herb mixture all over one side of the lamb belly, leaving the edges bare. Press the merguez over the herb mixture. Roll the lamb belly up from the long side and truss well. In a large heavy pot, like a Dutch oven, sear the meat well on all sides and set aside. Pour off most of the fat and saute the garlic and onions until translucent. Add the wine and cook briskly, until reduced by half. Add the tomatoes, ras al hanout and harissa. Taste and correct for salt and pepper. Bring to a boil, then reduce to a simmer and add in the two roulades. Cover the pot with parchment, then tightly with foil or with the lid. Slip the pan into the oven and let it cook for two hours, until the internal temperature has reached 160°. At this point, the dish may be refrigerated overnight. Remove the roulades from the sauce and store them separately. Place the roulades on a rack over a sheet pan and increase the oven heat to broil. Brush the roulades with the honey. Defat the sauce, then run it through the blender for a smoother sauce, or leave as it is for a more rustic application. Warm the sauce through. Put the roulades under the broiler for 5-10 minutes, turning as necessary, to crisp the outer layer of lamb. To plate, puddle the sauce on the plate, then add two or three pieces of the roulade, cut into 2″ segments. Garnish liberally with the herb mixture. Wow! Informative, creative and instructional. Terrific post, Cathy. Oh my….I wonder if my local farm (from which I already source lamb and goat) can get me this cut?? 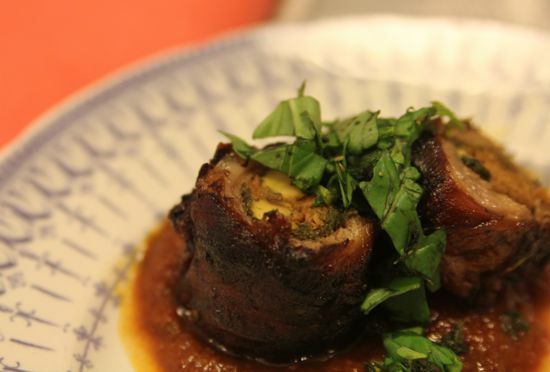 lamb belly or lamb breast…yumm! The photos are fabulous but the real thing was delicious and very special to share with the cook. Thanks for letting me be the taster, Cathy. It was melt in your mouth and not-too-spicy good. 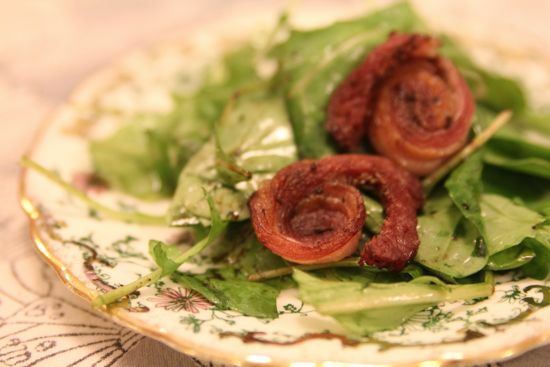 I’ve been dying to try this as well: Lamb Bacon! Sounds like the ventreche, but slightly different. Your roulade looks phenomenal Cathy and I really enjoyed the information; now that I’ve made pork belly my friend, sounds like it’s time to get to know lamb. You’re so creative! And those were some good-looking lamb bellies. I loved what you did with them and would like to know how the couscous carbonara turns out. We farm share with friends who have lamb which we help slaughter/butcher many times a year. 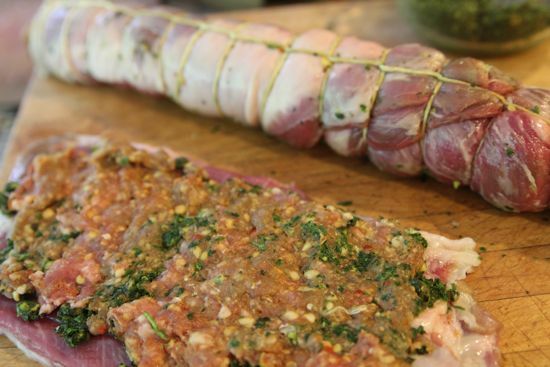 After getting Charcuterie a couple of years ago we decided to try curing lamb belly and voila – lambcetta was born. It’s strong, but is a delicious twist and makes a great (restrained) addition to pastas, or even pizzas, with some red wine vinegar and lots of herbs in the mix. We have also discovered the beauty of smoked and/or brined lamb. Whole brined and smoked leg of lamb (lamb ham) was a great sub for corned beef on St Patty’s day. It’s so much fun to play with it – I don’t know why we don’t see a more diverse treatment of lamb culinarily! Wow! now that you have got me all fired up about lamb six ways to heaven, I’m off to scout that little halah butcher shop in Nerac and get me some belly! Very good post and should be submitted for an award for ‘how to write a blog post’- you are the best Madame Brouette! Those are some awesome pics! 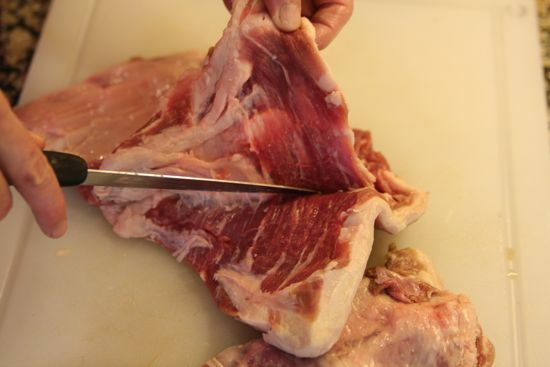 the lamb belly is the lower part of the saddle cut of lamb. We call it saddle flap. 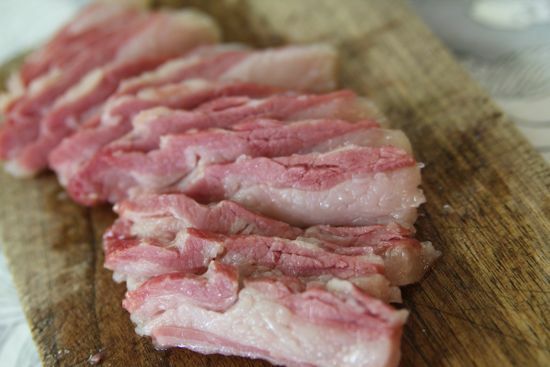 We have been selling lamb belly(flaps) to Blue Hill at Stone barn for years. Check our website for info all about lamb and we ship! Just ask for saddle flap and we will help you. I have just had a 2 year old Herdwick Ram killed and this recipe sounds interesting I shall adapt it for the belly meat, thank you!